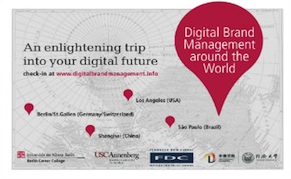 Top managers from around the world are meeting at the University of the Arts in Berlin for the first time to embark together on a one-of-a-kind journey: They will visit 4 of the world’s most pivotal centers of digital brand management to discuss personally with experts, peer over the shoulders of professionals and experience what works in digital brand management–and what does not. After Berlin they will travel to Shanghai, China, Los Angeles, USA und Rio de Janeiro, Brazil. Further locations are planned. On each stage of the journey participants attend 7 days of morning lectures from renowned professors at the best universities; afternoons are spent getting to know companies and agencies and discussing with experts. After it everyone returns home for three months until the next stage. Executives remain in contact in the meantime, refining their concepts and working on projects. How do brands establish deep connections with digital media and maintain the relationship over the long term? Join us and find out what the unique attributes of digital brands are and what you can do to build strong digital brands! How can I use the unique attributes of digital media and digital technologies for my own digital brand management work? How do I stage – like a theater production – my brand effectively in digital media? How can I tell exciting, successful stories? How can I place my digital brand management (concept) in the minds of my consumers and other important stakeholder groups? Increasing numbers of brands are online, including those from around the world. “Big” brands are long established online. Consumers are purchasing and ordering more and more online and via mobile. They are increasingly recommending their favorite brands among one another on social networks. In der Forschungsstelle Berliner Management Modell für die Digitalisierung (BMM®) wollen wir die Frage beantworten, wie Unternehmen und Organisationen die Digitalisierung erfolgreich managen können. Wie sieht die Digitale Markenführung der Zukunft aus? Worin unterscheidet sie sich von der herkömmlichen? Wie kann ich wirkungsvoll in sozialen Netzwerken agieren? Die Antworten werden über Erfolg oder Scheitern entscheiden. Erfahren Sie mehr über unser Digital Brand Lab! Sie haben Fragen? Gern stehe ich Ihnen zur Verfügung.